Enjoy a hike combined with the fun of a good old-fashioned treasure hunt! 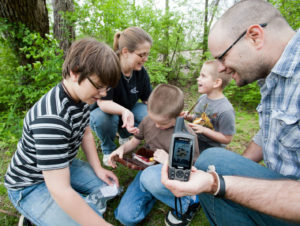 The Taconic Region of NYS Parks is excited to host its first Geocaching Challenge. Encompassing acres of trails, campgrounds, beaches, golf courses, lakes, valleys, historic sites, waterfalls, and stunning views, we welcome you to come discover and explore our parks and the great outdoors. Be one of the first 100 people to collect 45 out of the 78 hidden caches in the Taconic Region and receive the 2018 limited edition, highly collectible trackable geocoin. You may even visit the Central or Saratoga/Capital Regions to collect up to 10 stamps toward the Taconic Region Challenge. All of our caches will take you to an interesting area of our parks and or historic sites, and give you a little taste of history or environmental education. While you are geocaching, take some time and enjoy all that these parks have to offer. You and your family will understand why New York’s Hudson Valley is a great place to be. Please, remember to take only pictures and leave only footprints. Download the Taconic Region Geocache Brochure.